Folks, it’s true. I am the last food blogger on Earth who has not made Jim Lahey’s No-Knead Bread. Okay, well maybe not the last, but I am one of the last. I’m intrigued by it though and having tasted it (my lovely neighbor Julie is a convert), I can tell you that all the fuss is well-deserved. I bought the cookbook, I have the right size pot, now I just need to bake it. (I don’t think I will write about it though – haven’t we all read enough about no-knead bread?). I decided to make another of Lahey’s much-praised recipes for my first foray into his world. Pizza Bianca is one of those things where you look at the list of ingredients and think – that’s it? Or at least I do. But then I remember that my very favorite part of any pizza, even bad pizza, is the crust. So why not just one giant crust? To be fair, this is meant to be more of a flatbread than a crust. I imagine Lahey’s vision is somewhere between a foccacia and a pizza crust. I think what I made is a little closer to a foccacia and I didn’t quite get the dimpling technique right, but it was still really delicious. I cook and bake a lot but I have to say that pizza dough is not my specialty. I know that I just need to make it more regularly to get a better feel for the dough. (Did you hear that? That is Randy cheering in the background.) I am excited to try more of his pizza recipes in addition to that famous bread. 1. In a medium bowl, stir together the flour, yeast, table salt, and sugar. Add the water and, using a wooden spoon or your hand, mix until you have a wet, stick dough, about 30 seconds. Lightly coat a second medium bowl with olive oil and place the dough in it. Cover the bowl and let sit at room temperature, until the surface is dotted with bubbles and the dough is more than doubled in size, 9 to 12 hours. 2. When the first rise is complete, generously dust a work surface (a cutting board is useful here) with flour. Use a bowl scraper or rubber spatula to scrape the dough out of the bowl in one piece; as you begin to pull it away from the bowl, it will cling in long thin strands and will be quite loose and sticky. Using lightly floured hands, fold the dough over itself two or three times and nudge it into a loose, rather flat ball. Brush the surface of the dough with olive oil as sprinkle with the coarse salt (which will gradually dissolve on the surface). Put the dough in a warm, draft-free spot and let rise until doubled, 1 to 2 hours. 3. Half an hour before the end of the second rise, preheat the oven to 500°F, with a rack in the center, and place a pizza stone, at least 14 inches in diameter, in the center of the rack. 4. Generously dust a pizza peel with flour and place the ball of dough in the middle. Spread out the fingers of one hand, like a claw, and drive your fingers into the dough but do not puncture it. You want to simultaneously create dimples in the dough and spread it out across the peel. Continue working your hand across the dough and dimpling it until you have a bumpy disk about 12 inches in diameter. Drizzle the remaining olive oil over the top and sprinkle with the rosemary leaves. 5. With the peel resting on the counter, grasp the handle and give it a quick little tug; you want the pizza to just barely move but stay on the peel. (Loosening it makes it easier to slide it onto the baking stone.) If the dough sticks to the peel, gently lift it around the edges and add flour to the peel. Shake the pizza onto the baking stone. Bake for 12 to 15 minutes, until the crust is golden brown on the mounds but still pale in the dimples. 6. Slide the peel under the pizza and transfer it to a rack to cool for at least a few minutes before slicing and serving. You sold me with the fresh rosemary! You are not the last. Not even close. But how wild is this? My friend and new cookbook reviewer picked Jim’s book as the first book to review? As always, your pictures induce ooohs and ahhhs and make me want to get into the kitchen. My no-knead bread turned out too crusty. I liked it, but it just seemed to be ALL crust, and no bread. Plus, I like kneading! Regular bread is more my style, I guess. Confession, I have still yet to make that bread! I’m just so used to baking the wheat bread that we eat throughout the week that I’ve never set out the time for it, although I know I need to. It’s funny that you posted about pizza bianca because I was just thinking about making some last night, crazy. 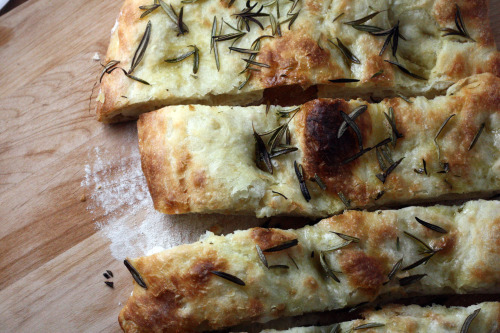 Rosemary, salt, and bread is always a good combination! No you are not the last! I just ordered the book on Amazon! We eat his pizza at Sullivan St. Bakery and also his NYC pizzeria/restaurant called Co. (Company) and it is SO GOOD!!! So, I wanted to make it. The book is beautiful, and even though I am yeast challenged, I will attempt some bread! Nope..I am here to! Not made it yet. Looks delish though! i’ve been meaning to make this for a long time too. when i was studying abroad in rome, i lived across from the Forno, where the best pizza bianca is produced (not that i’m biased or anything). it was magical, and i fear not reproducible. all that’s holding me back is not wanting to be disappointed, but i think i can handle this. i’ll have to try it soon! Lovely! I just bought the book yesterday and was about to add pizza bianca to this week’s menu until I saw that I needed a pizza stone and peel. Any recommendations on brands or Seattle-area stores with a good supply? I haven’t made it either! I have been meaning to for months now, but I’m not sure what I am waiting for. Although this pizza has me more intrigued. I will have to pick up the book and get baking! i made one of his loaf’s and I loved it. I’m not sure if it was the actual bread I loved, or the fact that it rose, and worked that i liked better. I’m with randy, keep it coming. This looks so good with the salt and rosemary. It’s blistered to perfection, and now I’m hungry! I love this recipe so much. It is one thing I miss badly since turning gluten free. My father keeps insisting I make some no-knead bread. Okay. Soon. I will finally do it. Your Pizza Bianca looks scrumptious! I haven’t made it. But then again, my oven doesn’t completely open so I haven’t made a lot of things!! Not the very last blogger in the Universe! I have not made it yet.In my defense, I will say that I have made many a loaf out of the book, “Artisan bread in 5 minutes a day.” Great book and in better bread! Particularly love the zatar flatbread, which this reminds me of. BTW, made your peanut butter brownies this last weekend. Very very good! Looks lovely! I made pizza dough the night before last. Rosemary would have been a nice addiction to it. Yahoo! You’ve come over to the warm, pillowy, fragrant, wonderful No-Knead side! I haven’t made it yet either, but after seeing your photos my tummy is growling! YUM! My favourite part of a pizza, or a pie, is the crust too. I love how the dough is puffed and browned in parts mmm. Well, you aren’t dead last. I have a copy of the recipe printed out somewhere and after looking at your pictures, I may have to join the wagon soon! Hi Dana- was looking for a good bread for a special birthday dinner and want to try this one. However, do you think it would hurt the biga to let it rise for a full 24 hours? 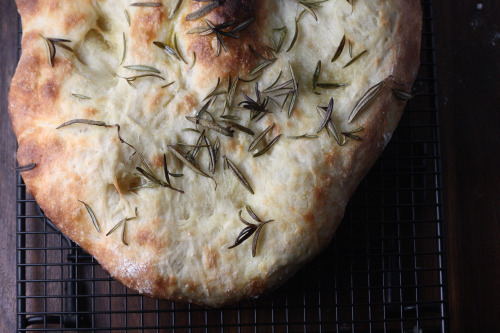 I work and can’t figure out the timing…we just planted some fresh rosemary and I am very excited to try this on my search for the perfect rosemary focaccia (even though its billed as pizza bianca! ).